The Rocket expander is a streamlined, self-activating expander. 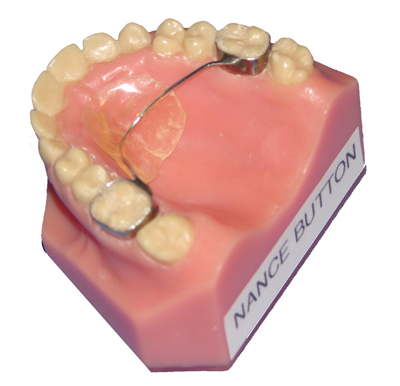 We insert it and it is programmed to expand on its own to create more space for your permanent teeth. The Rocket is two separate main pieces, one with a hollow end and one solid with a coil spring around it. We compress the spring, put the two pieces together, and then glue it onto your molars. The Rocket is now activated and will begin to gently expand. After a few months you will begin to see your most crowded teeth improve. The first few days with your new expander will be an adjustment period. Your teeth may be sore and achy. Tylenol or Ibuprofen can provide some relief. Eating may feel weird. Try softer foods in the beginning. Smoothies and puddings are easy to eat. You will have extra saliva in your mouth. Your brain thinks everything that goes into your mouth is food. Once your brain realizes that it can’t eat the Rocket , it will stop creating extra saliva. Some words may be hard to pronounce in the beginning. The more you speak the quicker you will get used to it. It may seem challenging to swallow, this is also only temporary. Give it some time. Do brush your Rocket when you brush your teeth. Do continue to see your dentist for regular checkups every 6 months. Don’t eat any sticky, chewy candy or gum. These can loosen the appliance. Don’t eat nuts or popcorn. These can get caught under the wires of the Rocket and irritate your gums. “Pirates Booty” popcorn is fine. It has no shell. 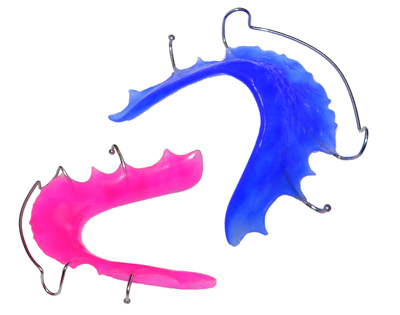 These specialized retainers are used to hold your expansion and continue to help guide your jaw growth and your bite development as you are growing. They can also help guide your new permanent teeth into a better position. This can have many positive effects in the future including a possible reduction in the amount of time you need to wear braces in the future. 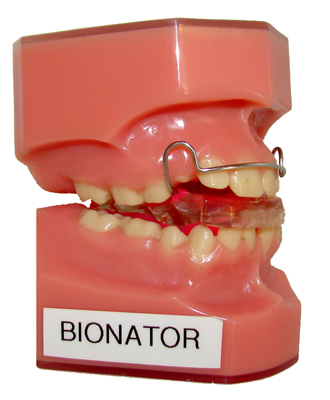 In the beginning your mouth needs to be trained to keep your Bionator or Frankel appliance in. We ask you to “exercise” for 20-30 minutes each day. By this we mean speaking with the appliance in your mouth. Please keep your teeth resting against the appliance when you do this. Do not bite hard, just rest them together. Reading out loud is great exercise. By doing this the muscles in your jaw will learn to stay closed at night. Your brain will also learn that this appliance needs to stay in your mouth when you are asleep. If your appliance falls out while you are sleeping, try to get more day time wear and exercise time in. Try and try again. Do brush your appliance with a toothbrush, toothpaste, and cool water to keep it clean. Do dry your appliance and keep it in the case when it is not in your mouth. Do keep your retainer away from pets, especially dogs. They think they are chew toys. Do call us if it breaks or is not fitting properly. Unfortunately, there is a replacement fee. Don’t eat with your appliance in. Don’t wrap your appliance in a tissue or napkin. It is easily thrown away. Don’t soak your appliance in mouthwash. You may brush it with mouthwash if needed. A Bite Plate is often used if you have a deep bite, which means very little of your lower teeth show when you bite down. 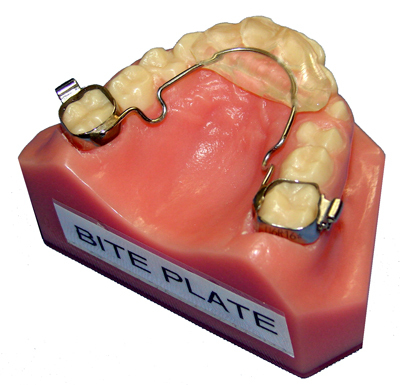 Bite Plates work with braces to align your bite properly and more quickly. It also prevents patients with deep bites from biting down on their lower braces, which is not good for your teeth or your braces. The first few days with your new Bite Plate will be an adjustment period. Your teeth may be sore and achy. Tylenol or Ibuprofen can provide some relief. Initially your teeth will only touch where the bite plate is. Hang in there. Eventually your back teeth will come together again. You will have extra saliva in your mouth. Your brain thinks everything that goes into your mouth is food. Once your brain realizes that it can’t eat the Bite Plate, it will stop creating extra saliva. Some words may be hard to pronounce in the beginning. The more you speak, the quicker this will go away. Do brush your Bite Plate when you brush your teeth. Don’t eat nuts or popcorn. These can get caught under the wires of the Bite Plate and irritate your gums. “Pirates Booty” popcorn is fine, it has no shell. Congratulations! You are on your way to a beautiful smile. Now that your braces have been placed, you will start to see your smile change. You may notice spaces that were never there before. Don’t worry, your mouth is under construction! Throughout your treatment we will adjust your braces to achieve the best bite and most gorgeous smile possible. The first few days with your braces will be an adjustment period. Your teeth may be sore and achy. Tylenol or Ibuprofen can provide some relief. Your cheeks may become irritated. 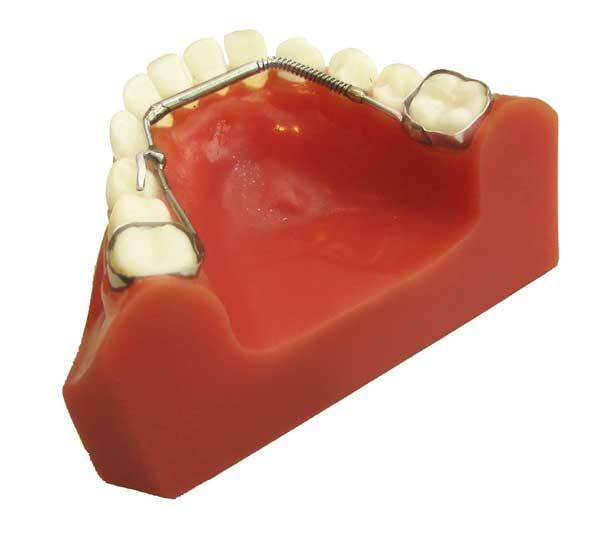 Wax can be placed over the brackets to give them a smooth feeling. Eventually your cheeks will get used to the braces. If a bracket becomes loose, no worries. Call us during our regular office hours. If an appointment is needed, the receptionist will schedule one for you. Sometimes we will just repair it at your next scheduled appointment. If a colored tie is not on a bracket, it is probably okay. Sometimes tiny wires are used instead. No need to worry or to call. Do cut up anything that is hard or crunchy and chew these foods on your back teeth. For example: carrots, pizza crust & apples. Do keep all foreign objects out of your mouth. Pens, pencils, ice and fingernails can break your braces. Do wear a mouth guard when playing contact sports. We can provide one for you if you need it. Just ask. Don’t eat any sticky, chewy candy or gum. These can loosen the braces. Don’t eat nuts or popcorn. These can get caught under the brackets and wires and irritate your gums. “Pirates Booty” popcorn is fine, it has no shell. If you can find it in this image, it is ok with Dr. Baum. However, use good judgment so as not to overdo it, ask permission at home if needed, and please brush well! Go nuts! 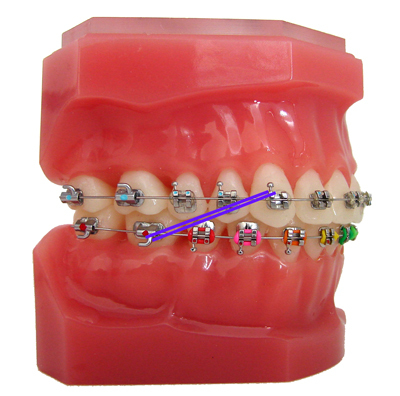 Elastics are worn with braces or an appliance to help close space and/or correct your bite. The elastics must be worn as instructed; usually 24 hours a day. Please take the elastics out when you brush your teeth. However, you may leave them in when you are eating (this is up to you). We would like you to put fresh elastics in several times a day. In the beginning the elastics may make your teeth sore. Tylenol or Ibuprofen can offer some relief. Eventually, your teeth will adjust to the elastics and you won’t even notice them (but only if you wear them as directed). Wearing your elastics consistently will help you achieve the best result possible and will help you get your braces off sooner. 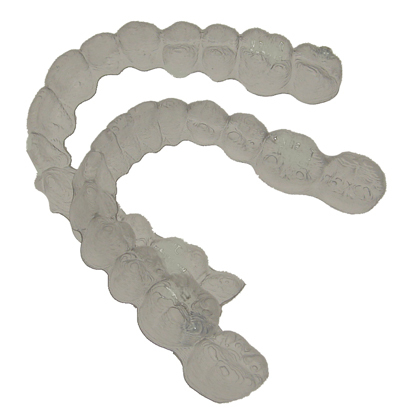 These elastics are worn from a hook on your lower first molar to a loop on your upper arch wire or to a post on a bracket near the upper front teeth. We will ask you to wear this style of elastics when we are closing space or reducing your overbite. These elastics are worn from a hook on your upper first molar to a loop on your lower arch wire or to a post on a bracket near the lower front teeth. 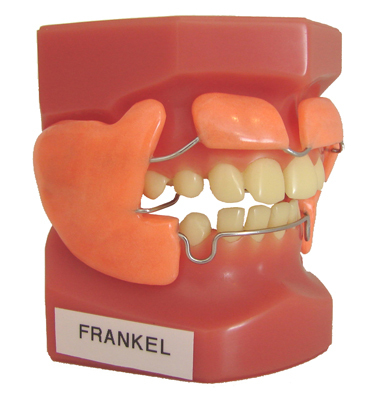 We will ask you to wear this style of elastics if we are trying to reduce an underbite. 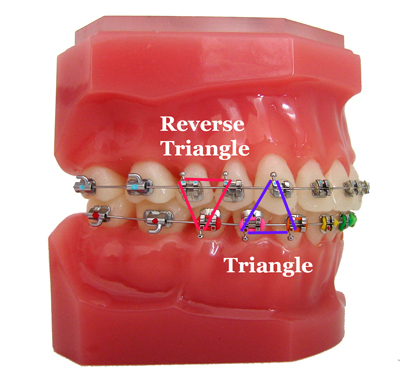 Triangle, reverse triangle, and box elastics are used to help your upper & lower teeth fit together correctly. You will attach them to the small posts that are on your brackets. The shape of a triangle or box is determined by Dr. Baum. The elastics will open and close with your mouth. 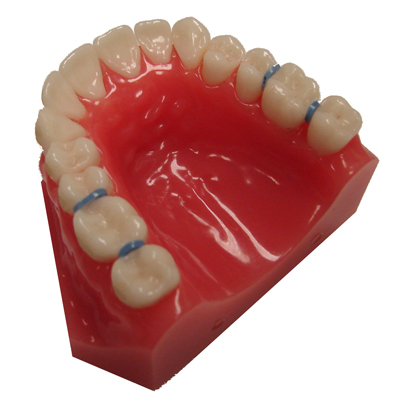 Midline elastics are a combination of a Class 2 elastic on one side and a Class 3 elastic on the other side. Dr. Baum will specify which way he would like them to be worn. 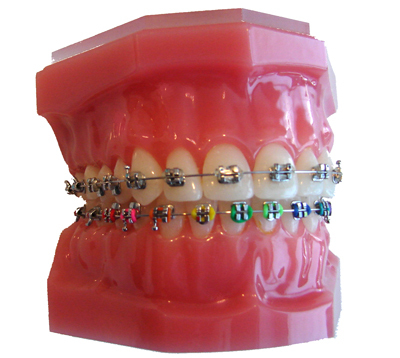 Please call us if you are unsure how to wear your elastics. 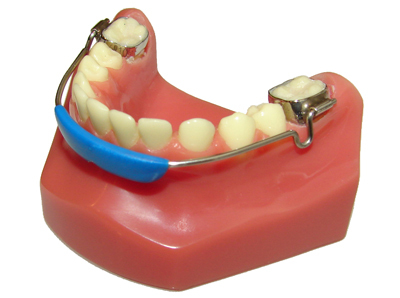 The face mask is used for young, growing patients that have an underbite or what is termed a Class III skeletal growth pattern. It is used in conjunction with an expander or other orthodontic appliance to slow the growth of the lower jaw and stimulate the growth of the upper jaw. 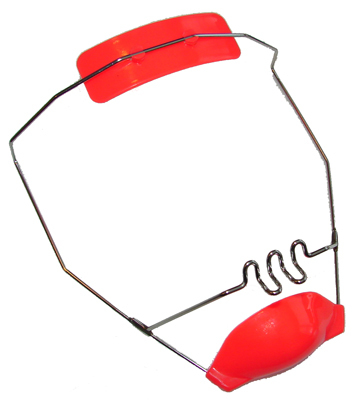 An elastic is attached in a criss-cross fashion from each hook of the appliance to the face mask. Most often, you will be instructed to wear the face mask at least 12 hours per night. The first few days with your new face mask will be an adjustment period. Your teeth may be sore and achy. Tylenol or Ibuprofen can provide some relief. Dry skin or a slight irritation can develop where the mask contacts your skin. Cosmetic pads that are available at most pharmacies can be used as an additional cushion between the mask and your skin. Do wear your face mask every night. We strive for 12+ hours every night. Do use a new pair of elastics each time you put on your face mask. Do bring the face mask with you to your appointments. 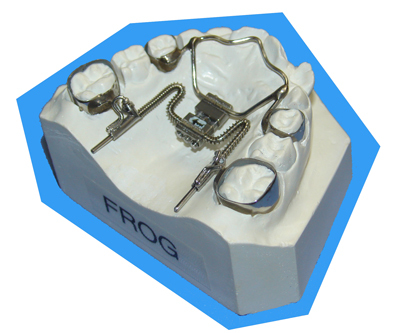 The Frog appliance uses a spring loaded mechanism to move your upper molars back, and to make more room for your teeth. The Frog appliance sits near the roof of your mouth and is held in place by four bands which are “glued” to your back teeth. The Frog is activated in our office by turning a small screw to compress the springs. After a few visits you may notice some space appear between your back teeth. This is normal. If Dr. Baum has asked you to wear elastics with your Frog, it is very important that you do so. The elastics will ensure that only the correct teeth move and that your overbite does not worsen. The first few days with your new Frog will be an adjustment period. Your teeth may be sore and achy. Tylenol or Ibuprofen can provide some relief. You will have extra saliva in your mouth. Your brain thinks everything that goes into your mouth is food. Once your brain realizes that it can’t eat the Frog, it will stop creating extra saliva. Some words may be hard to pronounce in the beginning. The more you speak, the quicker you will get used to it. Do brush your Frog when you brush your teeth. Don’t eat nuts or popcorn. These can get caught under the wires of the Frog and irritate your gums. “Pirates Booty” popcorn is fine, it has no shell. The Gosh can be used as an anchor to hold the molars in place until we move the other teeth into their proper position around them. Or it can help correct rotations of the molars that braces alone cannot correct. Usually, we will place bands on your upper first molars with tubes on the inside. The Gosh will connect by fitting into these tubes. The Gosh is a small stainless steel bar that is custom fit to the size and shape of your palate. This appliance will stay in until your molars have either straightened out or Dr. Baum is confident that your molars will stay where we have put them. The first few days with your Gosh will be an adjustment period. Your teeth may be sore and achy. Tylenol or Ibuprofen can provide some relief. Eating may feel weird. Try softer foods in the beginning. Smoothies and puddings are easy to eat. You may have extra saliva in your mouth. Your brain thinks everything that goes into your mouth is food. Once your brain realizes that it can’t eat the Gosh it will stop creating extra saliva. It may also seem challenging to swallow. This is also only temporary. Give it some time. It is normal to find an imprint of the Gosh on your tongue. If it is sore, please let us know. Don’t eat any sticky, chewy candy or gum. These can loosen the molar bands. Don’t eat nuts or popcorn. These can get caught under the Gosh and irritate your gums. “Pirates Booty” popcorn is fine. It has no shell. The Herbst appliance or H.T. is used to stimulate growth of the lower jaw and correct an overbite. The piston-like arms are attached to temporary stainless steel crowns that are “glued” to the first molars. At each visit your progress is checked and your bite is measured. An extension may be added to the arms as more growth is needed. Once the desired bite has been achieved, we will hold the lower jaw in its new position until a total of one year has been reached with the H.T. The first few days with your new H.T. will be an adjustment period. Your teeth may be sore and achy. Tylenol or Ibuprofen can provide some relief. Eating may feel weird. Your teeth no longer touch where they used to. Try softer foods that require little chewing in the beginning. Smoothies and puddings are easy to eat. You will have extra saliva in your mouth. Your brain thinks everything that goes into your mouth is food. Once your brain realizes that it can’t eat the H.T. it will stop creating extra saliva. Your cheeks may get irritated from the hubs where the arms of the H.T. are attached. You can try to cover up the hub with wax. If the irritated area seems to get worse, please call our office. Do brush your H.T. when you brush your teeth. Don’t eat nuts or popcorn. These can get caught under the wires of the H.T. and irritate your gums. “Pirates Booty” popcorn is fine. It has no shell. These are 3 very similar appliances. You will have two bands “glued” to your first molars that hold the appliance in place. 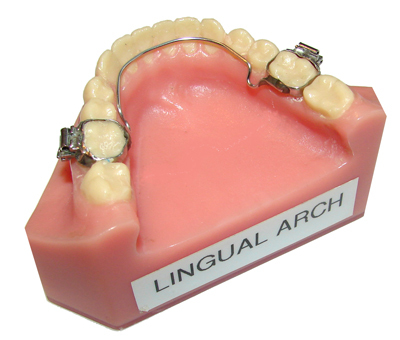 The Lingual Arch, Palatal Bar, and Nance Button are primarily used to maintain important spaces. Sometimes the space is naturally occurring, other times we may have created it on purpose. This can help the adult teeth have the room they need to erupt and perhaps guide them into a better position. Other times, these appliances are used as anchors for elastic wear. 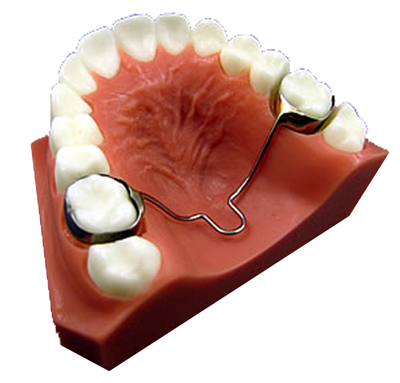 In this case, a small hook would be attached to each molar band. Of course, we would show you the proper way to attach an elastic to these hooks. You may have extra saliva in your mouth. Your brain thinks everything that goes into your mouth is food. Once your brain realizes that it can’t eat the appliance it will stop creating extra saliva. Do brush your appliance when you brush your teeth. Don’t eat nuts or popcorn. These can get caught under the wire of the appliance and irritate your gums. “Pirates Booty” popcorn is fine. It has no shell. 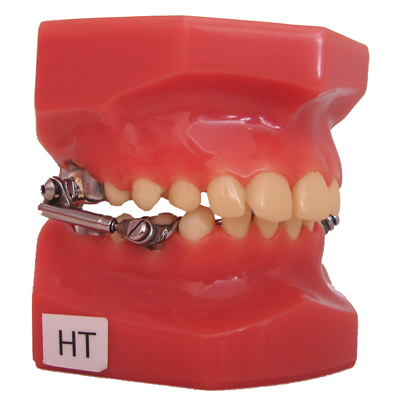 The lip bumper is a small appliance that is used to push the lower molars back and create more space for your teeth. It connects by sliding into tubes on the each side of the molar bands that have been fit and “glued” to your first molars. Since this is a growth appliance, it works slowly and gently. It is very important that you wear your lip bumper 24 hours a day in order to achieve the desired result. You should be able to eat with the lip bumper in and only need to remove your bumper when you are brushing your teeth or playing a rough contact sport. When you are not wearing it, you should put it in the lip bumper case that we have provided. Never put it in a napkin or paper towel as it can easily be thrown away. When you first get your lip bumper your molars may be tender. Try eating a softer diet until they feel better. This may take a few days. Tylenol or Ibuprofen can give you some relief. The inside of your cheeks may get slightly irritated. This should go away when your cheeks have had time to toughen up. If not, give us a call. Maybe we can adjust the lip bumper and make it more comfortable for you. At some point the lip bumper may lay flat against your front teeth, this is OK. It is still working and will be adjusted at your next appointment. Do take the lip bumper out when you brush your teeth. Brush the lip bumper too. Do continue to see your dentist every 6 months. Don’t play with your lip bumper with your lip or tongue. This can distort the tubes on your bands and cause your lip bumper not to fit correctly. 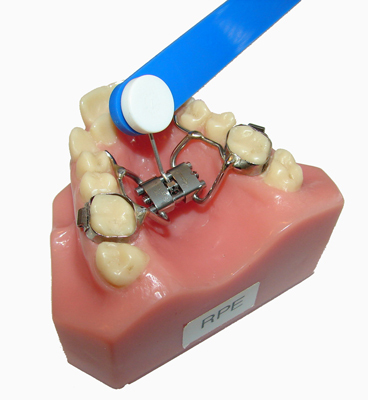 The Rapid Palate Expander or RPE is used to correct jaw width, resolve crowding, and correct cross bites. The only time in our lives that this can be accomplished is when you are young and growing. With the gentle turning of the “key” we can create more room and obtain the desired width. Each turn equals approximately ¼ mm, which is extremely small. If you miss a day, don’t panic, it is not a big deal. Just try to complete the instructed number of turns before your next visit. You will be instructed on how to insert the key into the hole towards the front of your mouth and to push it back gently until you can’t press back any further. At this point, a new hole should appear near the front and it is safe to slide the key out. Check our full website at www.baumbraces.com for an informational video about key turning. In the beginning you may experience some pressure or tingling in the roof of your mouth or in your nose. This usually goes away shortly. Space may also develop between the front teeth, this is normal and temporary. The first few days with your new RPE will be an adjustment period. Your teeth may be sore and achy. Tylenol or Ibuprofen can provide some relief. You will have extra saliva in your mouth. Your brain thinks everything that goes into your mouth is food. Once your brain realizes that it can’t eat the RPE, it will stop creating extra saliva. It may also seem challenging to swallow, this is only temporary. Give it some time. Do brush your RPE when you brush your teeth. Don’t eat nuts or popcorn. These can get caught under the wires of the RPE and irritate your gums. “Pirates Booty” popcorn is fine. It has no shell. Retention is the final part of your orthodontic treatment. When your braces are removed, it is natural for your teeth to try to shift slightly. Your retainer will help prevent this from happening. 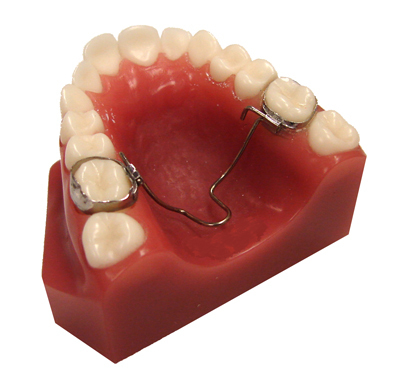 If cared for properly, your retainer can last for many years. If your retainer ever breaks or begins to fit less comfortably, it is usually best to continue to wear rather than not at all. However, please call us if this occurs. Beginning today, wear your retainer every night for a minimum of 8 hours per night, unless instructed differently. When you turn 21 you may begin to wear your retainer every other night indefinitely. The longer you wear the retainer, the better. 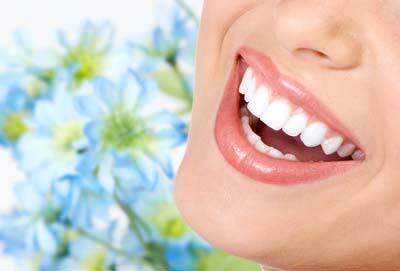 It is a lifelong commitment to keep your teeth beautiful. Do wear your retainer as instructed. Do brush your retainer with a toothbrush, toothpaste and cool water to keep it clean. Do dry your retainer and keep it in the case when it is not in your mouth. Do keep your retainer away from pets, especially dogs. They love the smell of your saliva and think that they are chew toys. Don’t eat with your retainer. Don’t wrap your retainer in a tissue or napkin. It is easily thrown away. Don’t soak your retainer in mouthwash. If it needs to be refreshed, you may brush it with mouthwash. Don’t use hot water to clean your retainer. Hot water will distort the fit of your retainer. Use cool water only. 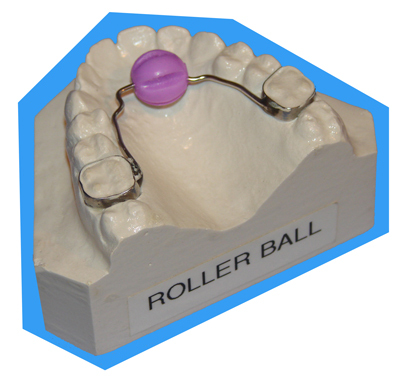 The roller ball is used to break a finger sucking habit or a tongue thrusting habit. No matter how young or old you are, we understand this is a difficult habit to break. It can also be a trying time for your parents as well. However, with a lot of persistence the end result will be very rewarding. For Tongue Thrusting: You are encouraged to “play” with the roller ball. With your tongue, try to spin the ball from front to back in a sweeping motion. This is the opposite of your natural tendency. Please do this often as we are retraining your tongue. For Finger Sucking: The ball will serve several purposes. First, it makes it difficult to fit your finger or thumb in your mouth and is a reminder that it doesn’t belong here. Second, the ball won’t allow your finger to seat in the roof of your mouth, so no suction can form. Third, since the ball spins, it provides a distraction. Your habit will not stop overnight. It takes time to change something you have done your whole life. The first few days with your new roller ball will be an adjustment period. Your teeth may be sore and achy. Tylenol or Ibuprofen can provide some relief. You will have extra saliva in your mouth. Your brain thinks everything that goes into your mouth is food. Once your brain realizes that it can’t eat the roller ball, it will stop creating extra saliva. It may seem challenging to swallow, this is only temporary. Give it some time. Do brush your roller ball when you brush your teeth. Don’t eat nuts or popcorn. These can get caught under the wires of the roller ball and irritate your gums. “Pirates Booty” popcorn is fine. It has no shell. These little blue rubber circles are used to create space between your teeth so we can easily fit the metal bands of your braces or appliance at your next appointment. Your teeth may be tender and achy for a couple of days. Tylenol or Ibuprofen can provide some relief. Softer foods are easier to eat when your teeth are sore. Please avoid sticky, chewy candies as they tend to loosen the spacers. If one spacer is lost, it is usually no big deal and does not need to be replaced. If more than one spacer falls out, please give our office a call. That way we can let you know if we will need to see you to replace them. If the spacers are lost right before your next appointment (within 48hours), it is usually not necessary to put them back in. This simply means that there is plenty of space ready for us to utilize at your next visit. Do continue to brush your teeth normally while wearing spacers. Don’t floss between the teeth where the spacers are placed. 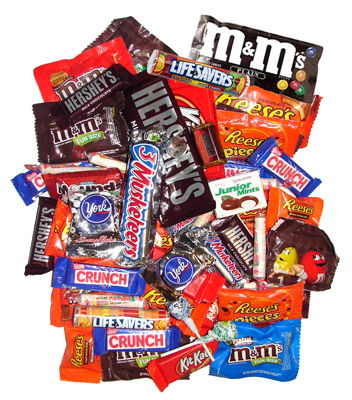 Don’t eat any sticky, chewy candy or gum. Don’t pick at your spacers. Proper tooth brushing is extremely important during your orthodontic treatment. We will instruct you on how to brush and floss around your braces. You should brush after each meal for 3 minutes. A soft bristled toothbrush with a small head is a good choice. Start by rinsing with water to remove the large pieces of food that may be stuck in between your braces. Next, poke the bristles on the end of your toothbrush, under the wires, between each bracket. Be sure to poke away from your gums. A small interproximal brush can be used instead. Now, holding the toothbrush at a slight angle, gently move the toothbrush back and forth making sure to get the area around and under the bracket hooks. Lastly, move the toothbrush in a circular motion over your teeth, braces and gums. When you’re all done look in the mirror and make sure your teeth look clean. In order to floss between your teeth, you will need to thread the floss under the archwire. A floss threader will make this easier. To be able to floss, you must first thread the floss under the arch wire. A floss threader can make this easier.